Many of you have told me that you feel tired, over it, done. Maybe you’re hurting or tired. Or, maybe you just need to see breakthrough in a major way. If that’s you, I felt like the Lord wanted me to encourage you to consider fasting. Combining fasting and prayer is one of the most powerful weapons in the Christian’s arsenal. When we humble ourselves before the Lord in prayer and fasting–not to manipulate God, but to boldly entreat His mercy and grace to help us in our time of need, and to align our hearts with His–miracles happen. I am leading my LifeGroup in a corporate fast from September 12 – October 2, the 21 days leading up to Rosh Hashanah (the start of the Jewish New Year and the beginning of Jubilee year 5777; Jubilee being the year on God’s calendar when the slaves were freed, debts forgiven, and everybody got a new start). If you’d like to join us on that fast, you may. I’m inviting you; comment below and tell me if you plan to join. I’ll be posting a blog series during that time about dreaming dreams that are worthy of God (big enough to match up with God’s promises). We’ll finish our series on the 9 power gifts of the Spirit between now and then. But I encourage you not to wait until then to begin fasting. If you’re in trouble, in lack, or going through a hard time, consider fasting now. Ask God how and what and how long you should fast. Even fasting one meal is worthwhile, if you take the time to pray and seek God. That’s it. If you’re going through a hard time today and hurting in any way, consider fasting and prayer. God will help you as you align your heart with His. i am Natalie from South Africa , and yes i want to join … i feel like you describing me above … as a single mum i face such financial pressure and i cry evr so often becuase its not working out .. I didnt expect to get an answer through your mail asap. Thank you, Father. Thank you, Jamie. So, please, put my name down for the fast. I’d like to join you in September through to October. Should I post my email, too. I love how God uses you to encourage me. It’s so amazing. Oh thank you so much Jamie for your words of wisdom. You inspire me so much and I can sense the Love of Jesus in your writing. Yes I would like to join the fast.. I forwarded the email to my daughters and my sister as well! Hi Winnie, I’m so glad you’ll be joining me. And I’m so thankful to Papa for encouraging you and helping you sense His love. His heart beats for you, and I pray He’d help you sense His presence even more today. Thank you for the encouragement to fast.Ive always said you are God sent to me,when we find time we can share more. For now kindly confirm my attendance in the upcoming 21 days fast. I Really would like to fast I want to know how to hear from God Jesus about how long to fast or anything please help me. Good Morning Jamie, Thank You! for your encouraging words on fasting & prayer. PLS. exclude me in. Hello this is Ravon and I’m joining the fast!! I had been thinking of fasting for a while and while I was spending time with God this morning I knew I needed to fast. I have read several good books on fasting and listened to CDs too. But I thought I’ll open my computer and look up fasting to refresh my memory and low and behold their was your e-mail and what was it about – Fasting! That confirmed it! LOL! God is awesome! 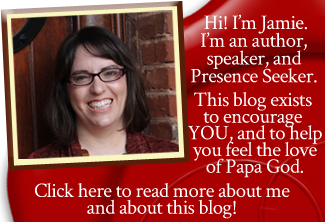 Thank you Jamie for your great article and for being so sensitive to Holy Spirit! Yes I will join you too! I need a breakthrough in our finances, my health and to close down PPH that started doing surgical abortions three weeks ago. I need to grow in how to fast and pray for breakthrough! It’s amazing how often your messages are exactly what I’ve been thinking or talking to God about! My name is Victoria, I live in New York. I would love to participate in the fast. Yes, I will be joining you in the fast. Hi sister in faith, I’m confirming that I’d love to join ur 21day fast. Yes I would like to join in your fasting.Pls keep me update.Thank you. I think it’s a great idea. My mother once did the Daniel’s fast if your familiar with that. I tried a 3 day one once, barely made it with just Communion. I think it’s wise to let Him lead you. Giving up a meal a day or some computer time won’t hurt us. And I’d remind everyone to smile and perfume your head, remember it’s not for outward appearances. I am in! God has impressed upon my heart to fast and pray and your message confirms it! I would like to fast. I have been trying to fast for a while, and I decided that I would fast from today until the end of August, probably going through September as well in one form or another. I had been considering it strongly, and then one person I follow posted about fasting on Friday, and now here is your post today. I will also join with you all on September 12th. I have a question, though. I thought we were currently IN a time of Jubilee and that it was ending soon? I have been sad about that because I have really been believing God for some MAJOR breakthroughs this year. If you could expand on that I would greatly appreciate it! I would very much like to join you on this fast. I’ve never done a fast for more than a day, but I am going to do this. I need to do it. Thanks for all you do. Hi jamie yes i will join the 21 day fast. September 22nd. Is my birth no problem im fasting breakfast and lunch i want to pray for cleasning repenting and for the body of christ and the lost. Thank you for your ministry and being a gift to us. Bless everyone who are responding. ? Jamie, I would like to join you and the others in this fast. Thank you for opening it up to us as well as your LifeGroup. Yes count me in and send remindar? I will definitely join you for fasting. I was searching your site for fasting, just one night ago, truly amazing. I will in the meantime start as I have real life issues. Hallelujah! Yessss, I’m joining you guys in this Rosh Hashanah fast! What an exciting time in the Lord & it’s also amazing to celebrate His holidays!! I’m so looking forward to what God plans to accomplish through fasting as we all draw close to Him in prayer and communion. Yes, will definitely be joining you in the fast. I’m in, will be joining you on your fast in September, October. I forgot to verbalize my commitment. I will be joining in the fast. So glad to hear it, Tameeka! You’re much on my heart these days. I hope you are well. I am praying for you. I will be joining the 21 day fast. ? I just discovered your blog about a month ago and I’m enjoying your content and revelations. Please count me in for the upcoming fast and I’m actually looking forward to it. Hi Lisa! I’m so glad you’re part of our community! Thank you for letting me know. I’m really looking forward to it too. 🙂 Big hugs to you today! Yes I am going to be obedient in this I am in. Count me in on the 21-day fast! Thank you, Jamie. Thank you Jesus. This is definitely what I need, fasting and prayer. Yes, I will join you. My Father passed away on 15 May 2015. My son’s father passed away a month after my dad. Then my marriage with my second husband, broke down. He left me with 6 year old twins. I’m tired of crying, I’m tired of hurting. I need God’s healing, wisdom, guidance, help and a financial breakthrough. Yvonne, I’m so very sorry that all these awful things have happened to you. I prayed for you just now. Big, big hugs to you, sister. May Papa comfort you, encourage you, and lift you up today. I believe He will meet you in precious new ways on this fast. I stand in agreement for your restoration and healing in Jesus’ name. Thank you so much for inviting us to join you and your Life Group in fasting! You can count me in. Joining in on the fast? Yes, I will join! My name is Tekesha Austin from Atlanta GA. Praise GOD, this is definitely divine order. Yes count me in on the fasting in September! I would like to take part in the September fasting, but I have never fast for more than three days. Yes, I would like to fast with you. I need financial breakthroughs. Can you e-mail me the day you will start fasting? I am a single mom and I have 2 jobs and very busy in my days off. I can only do partial fasting on my days off so I can be in prayer while I am fasting. I will be fasting with YOU & others! Gods’ blessing to us all. I will be fasting with the you and the group. Are there any directives? Are there directives for the fasting? You sent Theresa reply to me. Hi Diane, I just sent out the first encouraging word about the fast via email. I’ll send out additional prayer foci or directives as often as I can. I had hoped to be able to do so daily, but I missed the first day yesterday. 🙁 But will try to catch up and send them often, although I may not be able to achieve daily. Praying for grace and strength for you and all.